I have been busy building terrain to play in Frostgrave, a skirmish game set in a ruined city that has been frozen over in the past. I’ve been experimenting using aquarium and terrarium terrain to build cheap nice looking terrain pieces. 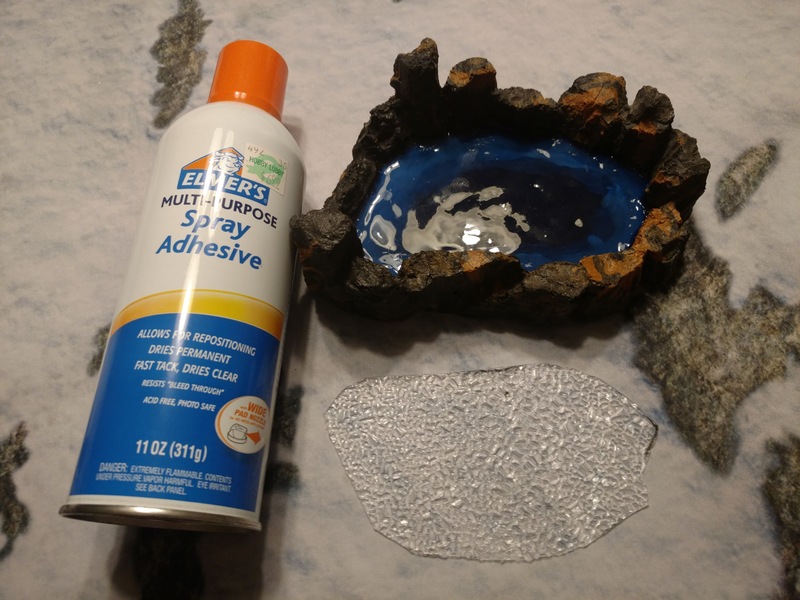 I’ve done up this quick tutorial on making a frozen pond. 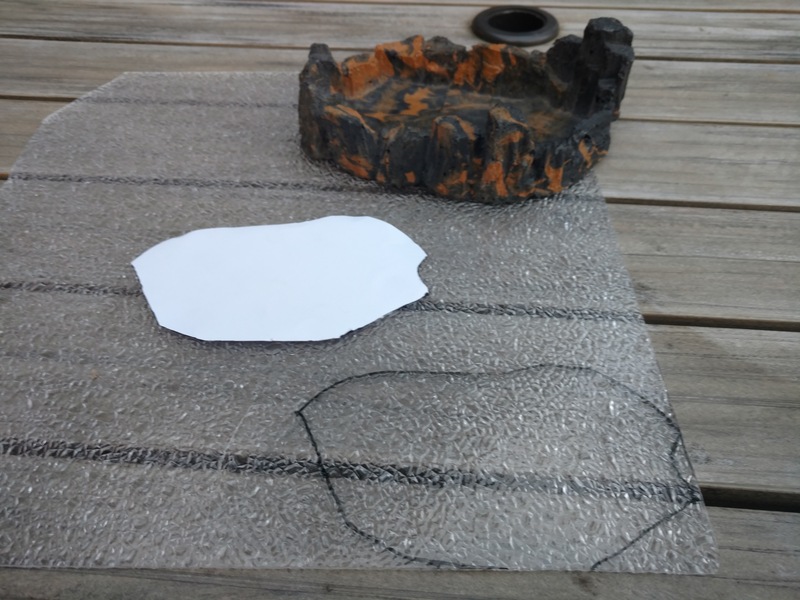 First thing is to make a paper template of the inside of the dish, you could make your own outer dish with foam as well if you didn’t want to buy a premade one. Trace the pattern out onto the cracked ice sheet. Start cutting it out and realize you flipped it over and need to start over (you can skip this step if you like). I use a hobby knife and some pliers to score and snap the plastic. Cut it a little bigger and then shave it down so it fits. Get a couple different shades of blue. You can use cheap craft paint as this will be covered up. 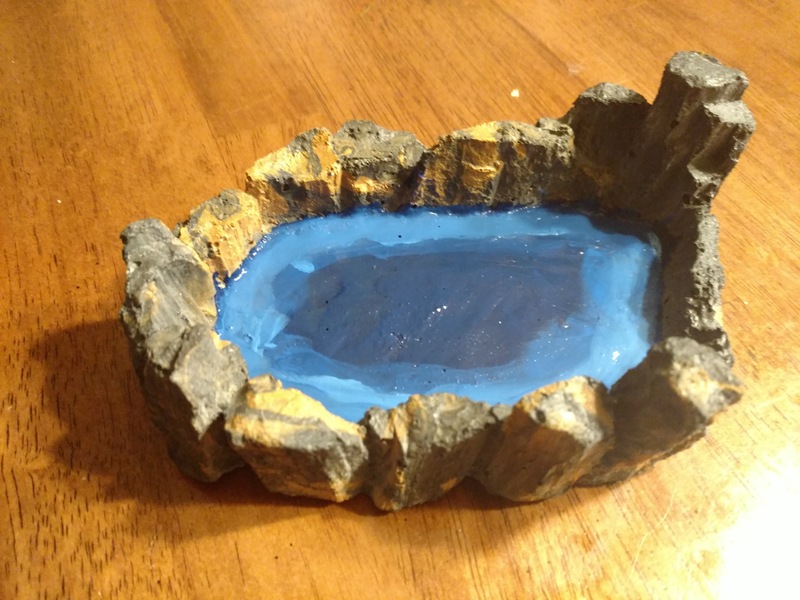 Paint the basin with the darkest color in the middle where the water would be the deepest. 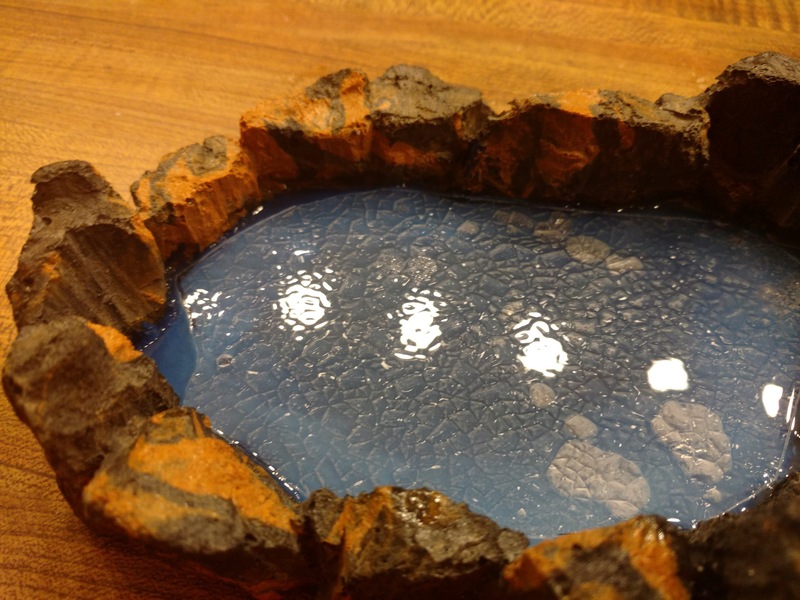 Pour about 1/8″ of realistic water into the basin and let set over night. If you want just water in the basin you can stop here. Glue the plastic down. I used spray adhesive but any clear glue will work. Combine snow flock and realistic water into a paste and apply to the gaps where the snow would drift into. I like to keep my eyes open for cool idea for creating terrain from. 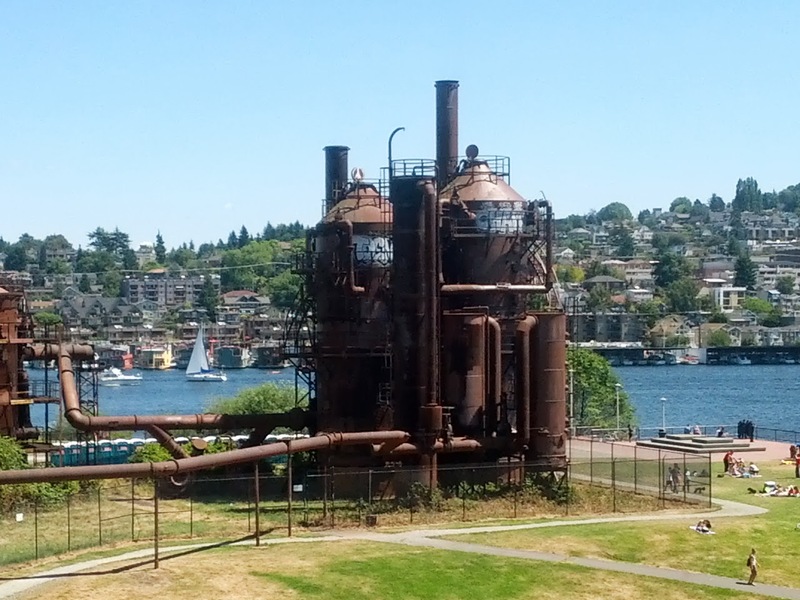 Today I took my son to Gas Works Park today to look at boats (his favorite thing in the world), and took a couple pictures of the old refinery equipment still at the park. 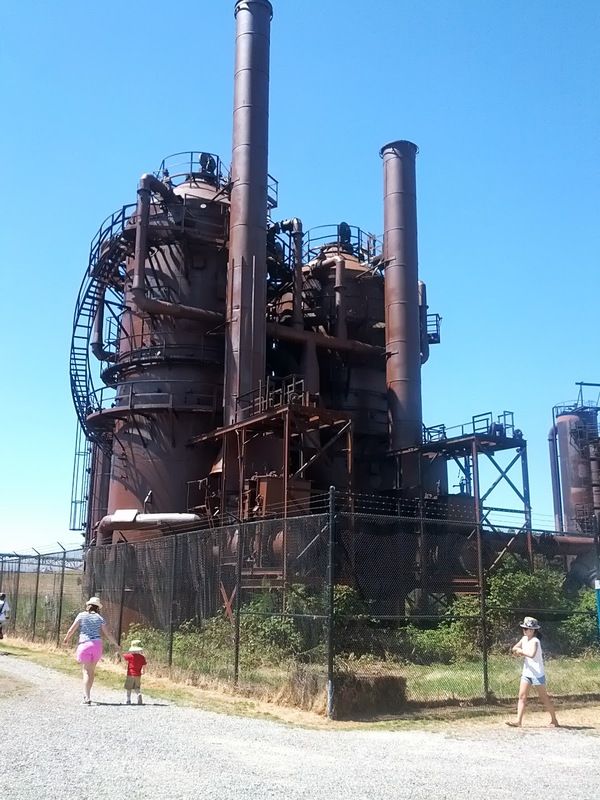 The park was once a natural gas refinery in the early 1900’s and has been converted to a park since it shut down. 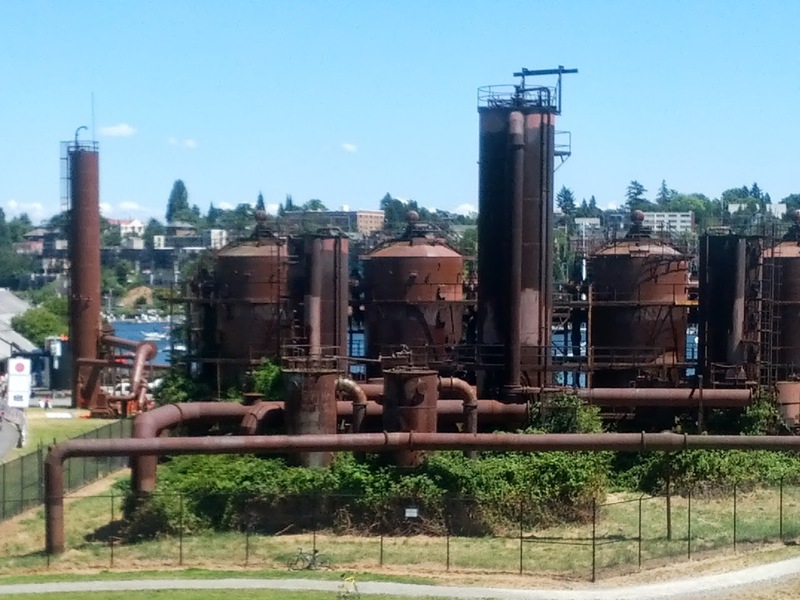 A lot of inspiration here, with lots of platforms and pipes coming out. 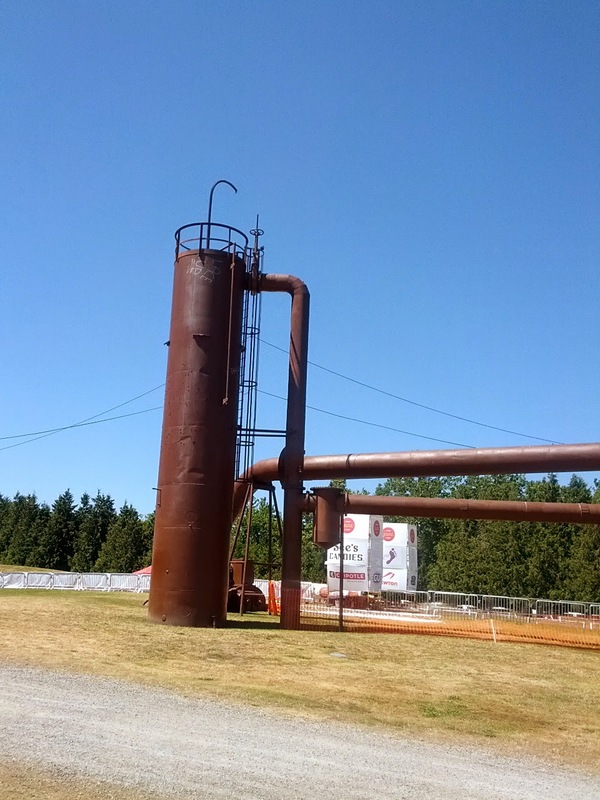 Looks pretty easy to build with pipe and other cheap materials. Was out of town this weekend but was able to finish up two Crisis Suits I started a while ago. They were actually very simple to paint up and look pretty good. I also got a Pegasus Hobbies Technobridge and sprayed it last night. Not sure if I will do more to it, as it looks pretty good as is. 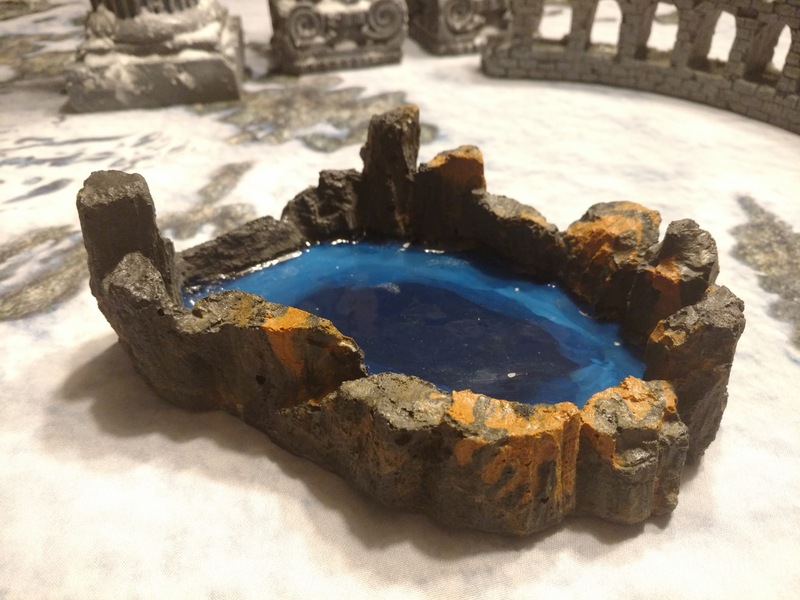 Nice inexpensive piece of terrain which will work great for the large river running through the middle of my table. A few updates. So I watched Return of the Jedi again to see what else I could steal for cool ice terrain and started on a few more pieces. Laid everything out to see how the terrain density would be. I have about 25% coverage including the pipelines which can’t be removed (not counting the giant iced over river). I need one more solid piece of terrain to feel comfortable with the table, and will build a few beyond that for varieties sake. One thing I definitely will do, is make a larger island with a nice piece of LoS blocking terrain. I’m thinking a pumping station, to go in the middle of the board. Maybe a couple of small islands to go in the river to not always have the middle of the board open. Sorry about the image quality but this was just a test setup in the kitchen. Also these are all work in progress. Pretty much just primered and textured at this point. 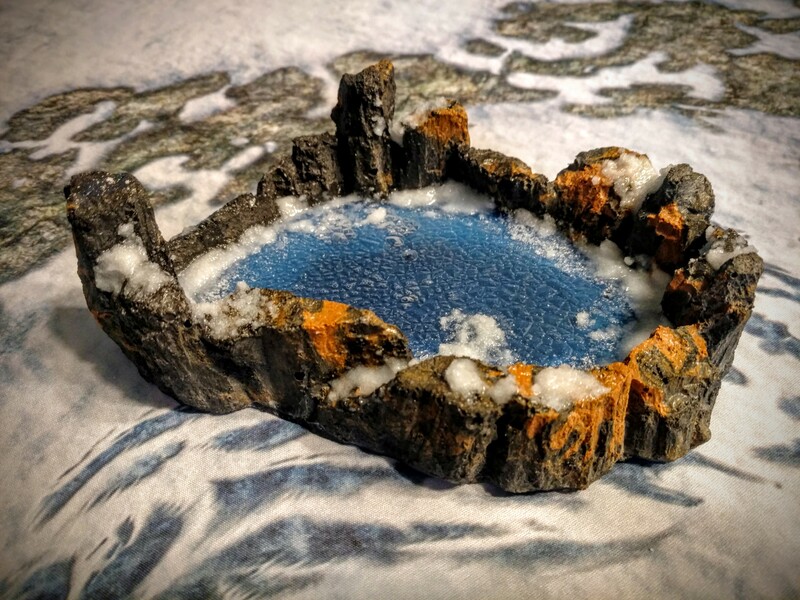 I finally found an affordable solution for making the frozen river for my ice board. Ceiling panels for florescent lights to simulate the ice. 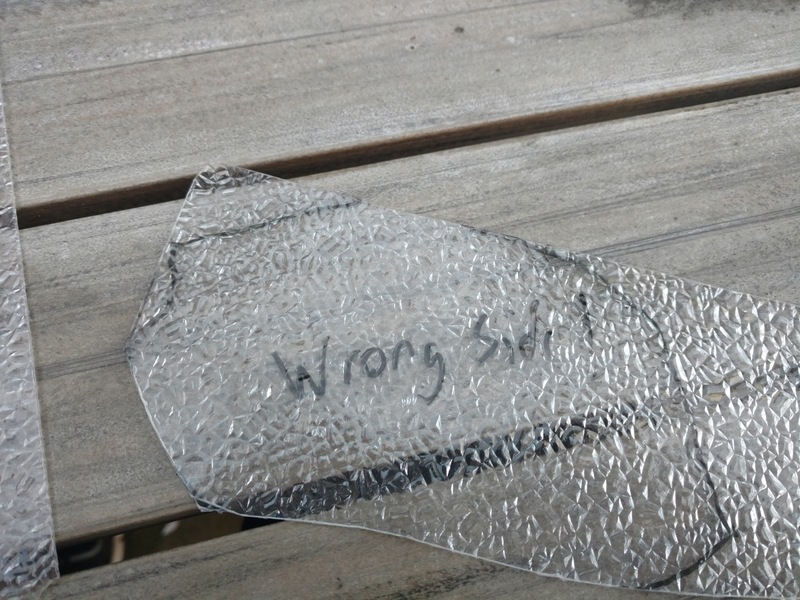 This is a translucent cracked ice type and runs about 10 bucks for a 2×4 foot section. Two of them will be enough to do the large river on my table. 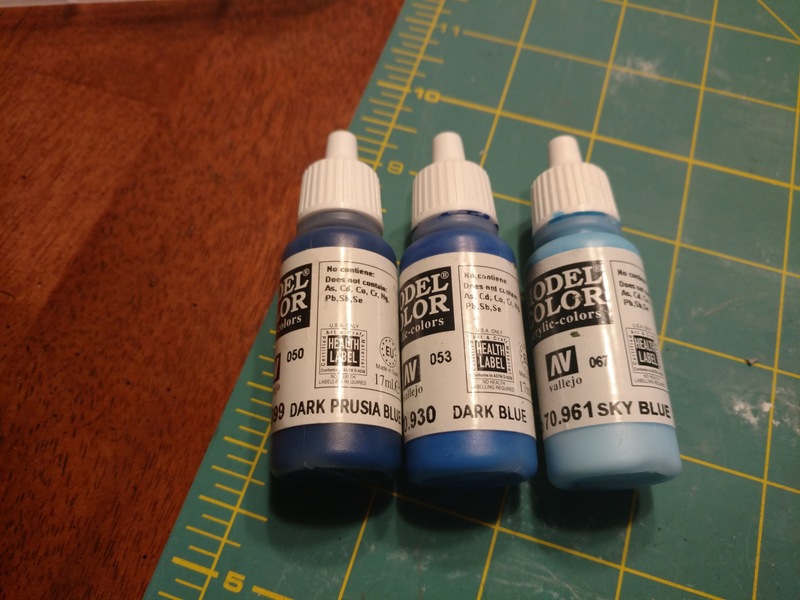 Certainly better than the estimated $100 bucks worth of resin I thought I was going to need. I had thought about trying it, but saw it in action here and new it would be perfect. The one problem I ran into is that the panels are actually 23.5 inches vs 47.5 inches. So for one of the panels I needed to use multiple pieces. Rather than have a straight seam, I cracked and broke it into pieces and then used Woodland Scenics Realistic Water to make it look like the water was flowing up through the crack. The water seeped under the plastic to give a really nice looking effect. I’m really happy, I just need to do some snow banks along the edges to cover up the rough cutting. 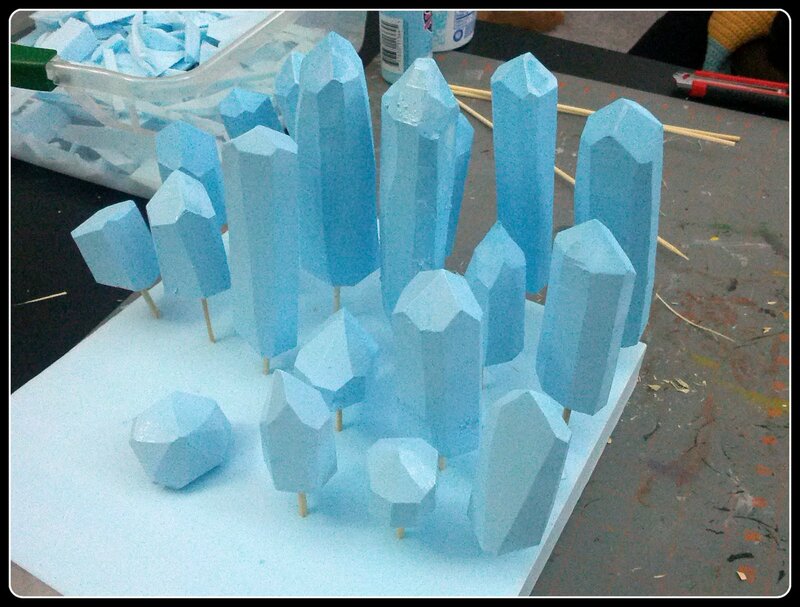 Last year I attempted to do some ice-crystal terrain and failed miserably. This year it worked out a lot better. 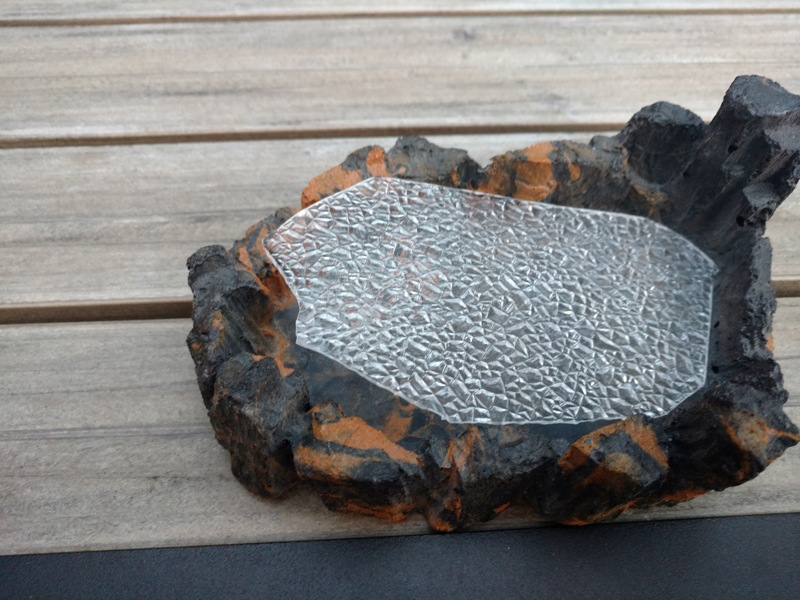 I also have an idea for doing the ice on the table I’m working on as well. Finished these miniatures up while visiting my parents last week. I’m actually taking a little Eldar break and going to re-paint/finish my second Land Raider for the Lamenters. I managed to get all of the white portions painted yesterday and it is really coming together. I will give the snow areas a coating of Future floor to give a nice glistening effect and then I just need to figure out how to do my ice. 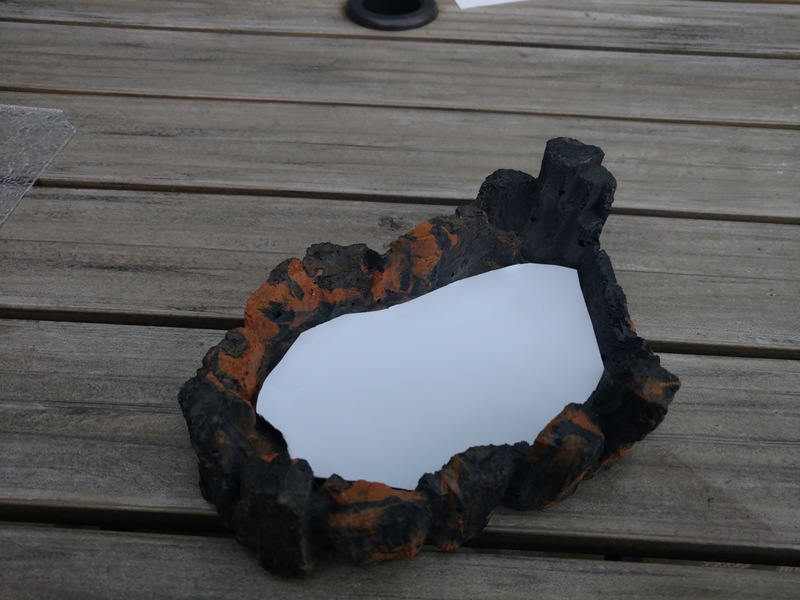 I’m thinking clear resin with a little blue and a little white ink or paint mixed in. I’ll try to pick some up this evening for testing purposes over the weekend. Gloss varnishing the ice pillars fail! Last night the wife and I had a crafting/Star Trek night. 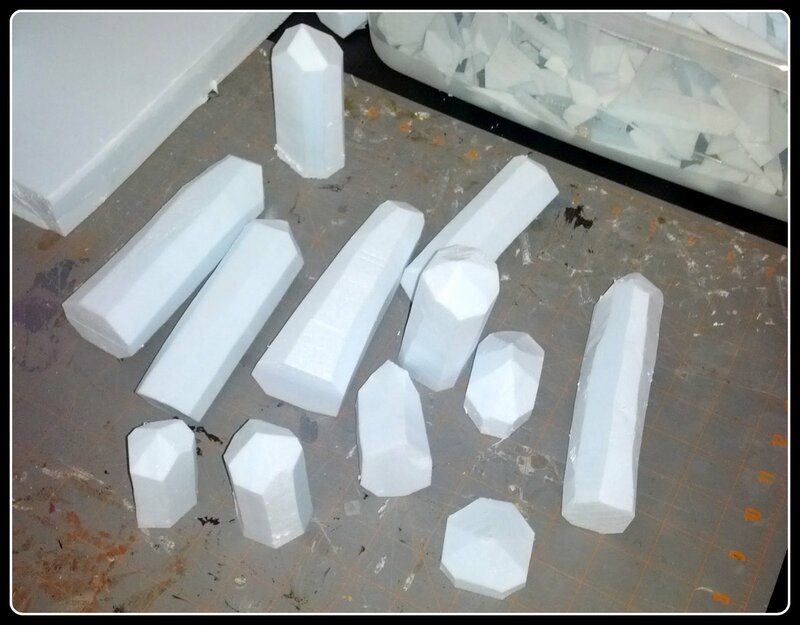 While she worked on some crocheting I pulled a bunch of scrap foam from building the table to work on some ice crystals to use as terrain. Managed to make a whole bunch of various sizes and was pretty pleased with the result. I used some cheap acrylic craft paint (only slightly darker than the actual blue of the foam) and dry brushed the edges white. This morning before work, I took them outside and gave them a spray of gloss varnish to give them a nice shinny look, but to my dismay they started dissolving away despite the paint! 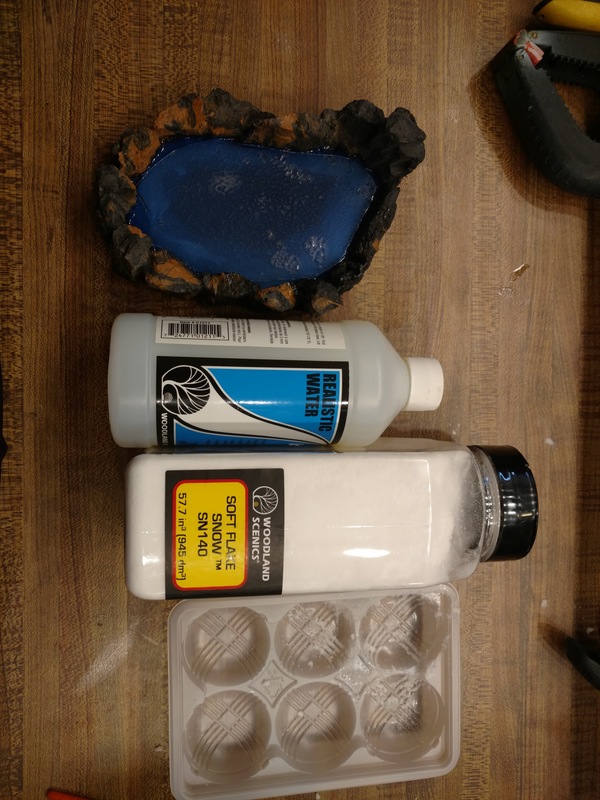 Generally I use a thicker latex paint on foam which will protect it enough that spray paints and varnishes will work, but the acrylic paint is not thick/strong enough. 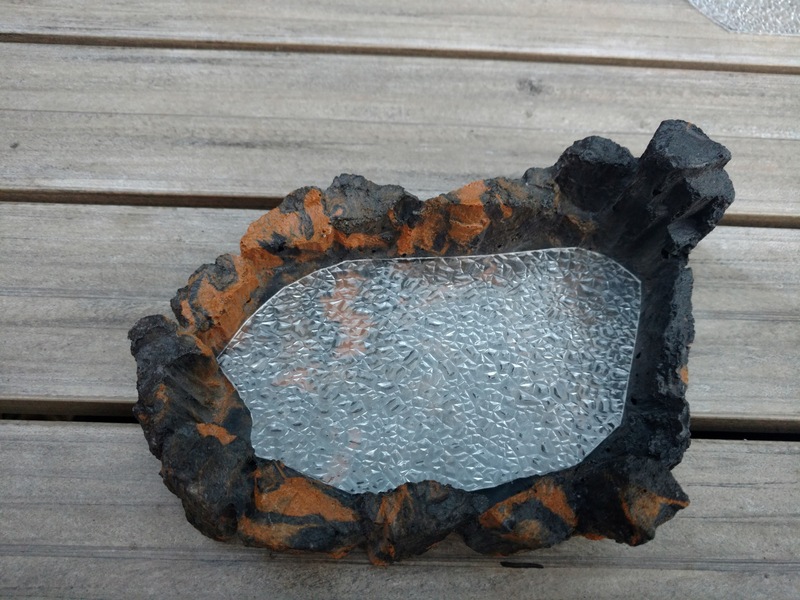 Probably half are ruined beyond repair, the other half should be alright, but I’ll need to make more. Next time I’m going to use Future Floor polish through the airbrush instead to avoid further failure. Did a little more work the last few days. Put the third board section together (also have enough left over to do a fourth board later), and sanded the flat snowy portions of the board. Next step will to do the white over-brushing to give a better snow effect. I will probably end up gloss coating the board as well to have it look a little more snow-like. I still need to figure out how to do the iced-over river. 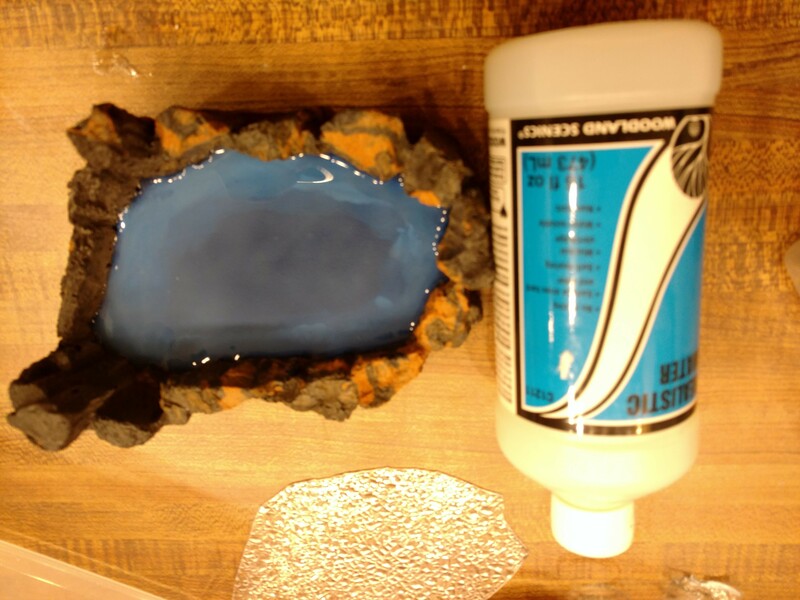 Probably use resin with a little white and blue paint mixed in to cloud it up a little and give that a try. Also time to start making plans for the various terrain bits that I will be doing. Probably will start on the ice-crystal forests tonight and plan some pumping station style buildings. Not sure what else I want to do. I also found a similar board here that someone has built, and will be using some of his ideas, especially on the ice crystal forest. Hopefully mine looks as good when it’s finished.